Our corporate office is now located just off of the St. Albans exit of I-64. At the bottom of the exit ramp make a right at the stop light. Go a few hundred feet and make a right in between Clayton Homes and Riverside Pre-owned Auto Sales. Take the road in the center going up the hill. Stay to your left at the top of the hill and come around to the back of the brick and tan building on your left. Look for our sign on the door. We are on the 2nd floor. 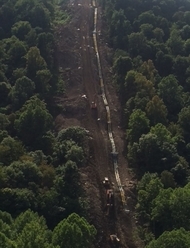 Ace Pipeline Inc specializes in midstream and transmission pipeline installation in the greater Appalachian region. 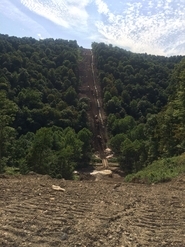 We focus on providing a safe working environment and providing a great service to our customers in meeting all deadlines as well as environmental remediation for a finished project. Ace has a very experienced team of key people with many having 20+ years of working in the pipeline construction industry. As a member of the Pipe Line Contractors Asscoation we utilize a workforce from the the Laborers International Union of North America, the International Union of Operating Engineers, the International Brotherhood of Teamsters, and the United Association of Journeymen and Apprentices of the Plumbing and Pipe Fitting Industry of the US & Canada.